Muscle car is a term used to refer automobiles that have high performance. This term was generally referred for cars of American, Australian and South African models of the earlier 1960s and 1970s. A muscle car generally describes a car with 2-doors rear wheel drive and normally is mid size. This car has a large and powerful V8 engine and special trim. This trim helps in achieving maximum torque on the streets and in racing competitions. Muscle cars were entirely different from small sport cars. Muscle cars were called the “super cars” of the time. They were very popular in racing the quarter mile which was their performance standard. 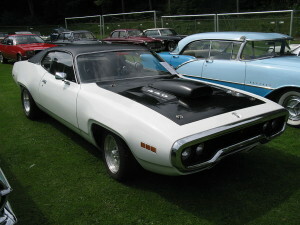 Some of the popular muscle cars were Chevelle, Camaro, Nova, Road Runner and Cuda. Among these cars some of the fastest muscle cars were Road Runners, Chevelles and Chargers. These were called family cruisers. The power of these cars lied in their engine design. Men for their transportation used Camaros and Cudas, and initially these cars were sport cars. The Chrysler line of muscle cars was affectionately called the Mopar muscle car. These Mopar powered cars were a favorite of the muscle car owners because of their sleek design and the famous Hemi engine. The Chevelle SS line of muscle cars from Chevrolet was also a sleek designed “Super Car” with the huge 454 cubic inch engine it fast became a favorite for muscle car owners. This car was ranked 3 in muscle car category. This car was able to achieve a speed of 112mph in 12.80 seconds. The engine model used by this car was 440 Six BBL. Horse power of this car was 390 and it came with 4 speed manual transmission. It was 4 in ranking. Performance of this car was quite pleasing and most of the people liked its body style. It achieved a speed of 107mph in 13.10 seconds and its engine type was a 426 Hemi. Horsepower of this car was around 425; it was available in a 4 speed manual. The 1970 Chevelle ranked number 5 in the muscle car category. It had a strong standard six speed, 454 cubic inch performance engine. These engines had a controlled combustion system and exhaust emission control systems, these emission control systems were quite impressive in performance, they also came with a transmission controlled vacuum spark. This Chevelle SS454 was a powerful car that acquired a speed of 107mph in 13.12 seconds. It came with a 4 speed, 450 hp vehicle with 454LS6 engine. This car was number 6 in ranking when compared to other speedsters. The Camaro that was tested acquired a speed of 100mph in 13.12 seconds. And its engine was 427 ZL1. It came with a 430-horse engine. It also included a 4 speed manual transmission. A 1968 charger tested at a speed of 105mph and it acquired that speed in 13.50 seconds. The engine in this car was a 426 Hemi and it had an automatic transmission. The Hemi was the engine of choice by these Charger enthusiasts during this time. Here is a 1969 charger 500 and it was ranked 11 in performance. This car achieved a speed of 109mph in 13.48 seconds. The engine model was a 426 Hemi. The Horsepower of this car was a 425 horse engine. It also included a 4 speed manual transmission.